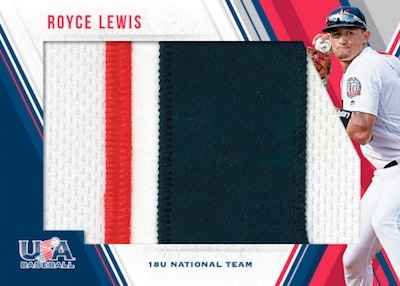 Geared to the national team, 2018 Panini Stars & Stripes USA Baseball still touches on many different options, including young prospects, current stars and retired greats from the Collegiate National Team and 18U National Team. The hit-per-pack hobby format contains five premium inserts that can be either autographs or relics. Similar to the 2017 release, the 2018 edition is only base cards, base parallels and hits. 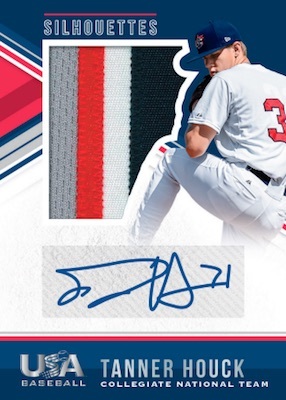 The set promises over 40 on-card signers and autographs from many of the projected first-round draft picks in the 2018 MLB Draft. 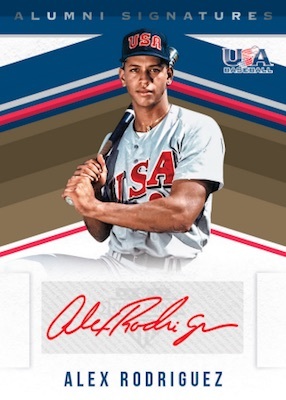 With 100 subjects, the 2018 Panini Stars & Stripes USA Baseball checklist casts a wide net in building the base set filled with past and present players. Combining to fall one per pack are the limited base parallels. Blasters have exclusive Longevity base cards. Signed inserts include Alumni Signatures for the all-time greats like Frank Thomas and Alex Rodriguez. In addition, these come in short-printed Black Ink, Red Ink and Green Ink parallels. 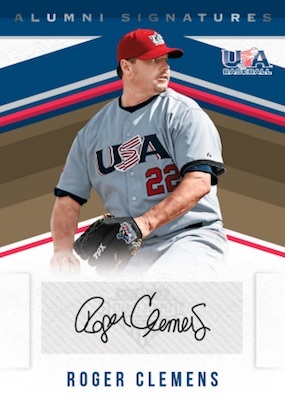 Adding a relic piece, the USA Silhouettes cards can be found with bat or jersey relics. There are also Prime and Gold Ink parallels, plus Black, Blue, Red and Green versions. 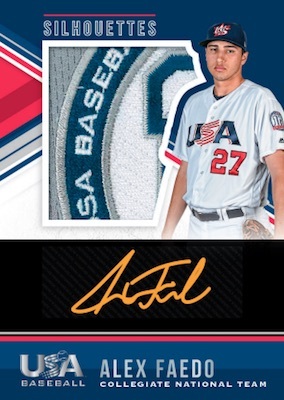 Exclusive to hobby are the Chinese Taipei Silhouettes cards featuring patch, brand logo and laundry tag options. 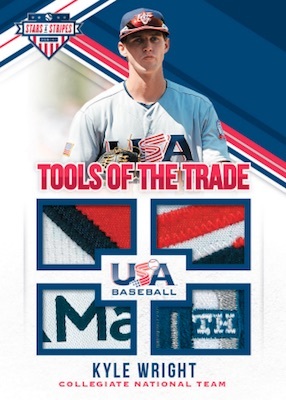 Highlighting rising stars, 2018 Panini Stars & Stripes USA Baseball also has multi-relic Tools of the Trade cards, as well as Jumbo memorabilia cards for young players. Both offer Prime versions, as well. These are mock-up images and not final cards. 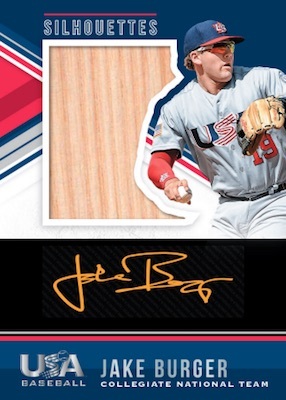 Shop 2018 Panini Stars & Stripes USA Baseball autographs on eBay. LONGEVITY BASE PARALLEL: Base, Ruby #/249, Sapphire #/49, Emerald #/5. 25 cards. Serial numbered #/499. PARALLEL CARDS: Red Ink #/10, Green Ink #/5, Red/White/Blue Ink 1/1. PARALLEL CARDS: Black Ink #/23 (or #/25,/22,/21), Red Ink #/10 (House/Corona #/9*), Green Ink #/5. See spreadsheet for specific Black Ink print runs. PARALLEL CARDS: Buttons #/8 or #/7, Tag #/3 or #/2. PARALLEL CARDS: Brand Logo Mizuno 1/1. PARALLEL CARDS: Prime #/25 or less, Buttons #/8 (McCarthy #/6), Laundry Tag #/8 or less. See spreadsheet for specific parallel print runs. 3 cards. Serial numbered #/299. 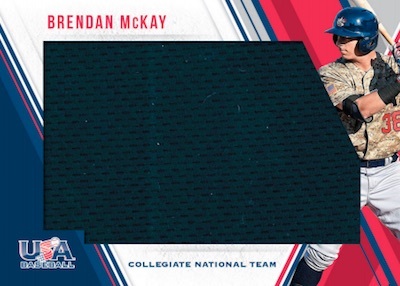 PARALLEL CARDS: Black Gold #/89 or less, Prime #/25 or less, Black Gold Prime #/10 or less, Patch USA Baseball #/4 or less, Brand Logo Majestic 1/1, Laundry Tag Majestic 1/1, Team Tag 1/1, Patch Cuba 1/1 (Only #1-26), Patch USA 1/1 (Only #1-26). All subjects are not in each parallel. See spreadsheet for specific details. PARALLEL CARDS: Prime #/25 or less, Jersey Number #/10 or less, Nameplate #/5 or less, Helmet Logo 1/1, Patch 1/1, Flag 1/1, Brand Logo 1/1, Team Logo 1/1. All subjects are not in each parallel.See spreadsheet for specific details. 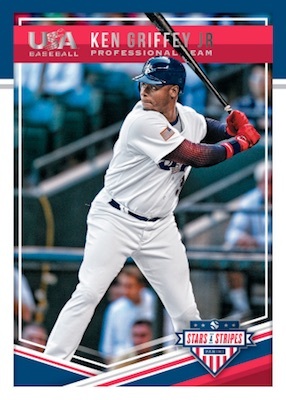 View the 2018 Panini Stars & Stripes USA Baseball checklist spreadsheet. Stupid question but I assume this is hobby only yes? Stars & Stripes usually has a retail Longevity box version. However, no official word yet.